On Febraury 24th 2011, I wrote this post. We were struggling pretty badly to pay the bills at the time and things were not very jolly at the shop. I also put our plea on Twitter and on Facebook. The result was absolutely phenomenal. Over the next few weeks the outpouring of generosity towards the shop was quite simply incredible. As the story of our plight went global, amazing things started happening. We had donations from all over the world from people who hadn't even visited the shop but empathised with our position, we suddenly had hundreds of new customers coming through the door, our online sales were staggering, and events were organised by other people to help raise money for us. It was blinking bonkers brilliant. But something else happened too. Something rather special. We realised that there were lots and lots of people; our customers and now our friends, who had always come in to the shop and bought their books from us rather than anywhere else, who totally believed in us. Who cared so much about the shop that they would go out of their way to make sure that we survived. We heard stories of a woman standing outside Boots, further up the road from us, shouting about our shop and telling people how important it was that people bought a book from us. Local Residents Associations shared our tale of woe to their members. We had visits from people every day who said that "lovely loyal customer' insisted that I come in and buy a book from you". What happened was that we got our belief back. More accurately, we were given our belief back. The 9 months before our appeal had been hard. Very hard. We worked our socks off to keep things going but it didn't seem to be working. We began to think that maybe, what we were doing wasn't what Wood Green wanted. 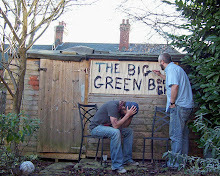 That maybe the Big Green Bookshop wasn't what people wanted. But it seems that you wanted us to stick around. Before we opened we took out a £60,000 bank loan. Last week we paid the final instalment of that loan off. Thank you. Thank you so so much. I know that without a doubt we have the greatest customers in the world. World Book Day this year is on Thursday March 1st. We like World Book Day, although it has crept up on us a bit quickly this year. We like it because it achieves what it sets out to do. It's a celebration of books and reading and it encourages and gives kids the opportunity to read. What a brilliant thing that is. Here's another thing. Every child under 18 is entitled to a £1 World Book Day voucher. This voucher is distributed by schools and nurseries around the country. These are like £1 Book Tokens which kids can spend in pretty much any bookshop. Most of these vouchers are exchanged for the special £1 books that are produced for the day. This year the list of books is better than ever. During the week that World Book Day falls, lots of schools really get behind it and put on a week of activities to show kids how brilliant books are and how ace reading is. We've arranged 13 author visits during that week, and we have some amazingly brilliant authors who'll be going into schools and sharing their passion for books. Author visits can be totally brilliant and have the capacity to change a reluctant reader into the most passionate booklover. I've seen this happen on many occasions and it's truly wonderful. So as well as authors including Tamsyn Murray, Ivan Brett, Miriam Halahmy, Graham Marks, Fiona Dunbar, Guy Bass, Ciaran Murtagh and Keren David visiting schools we will also be having story telling in the shop on the day courtesy of Good Little Wolf author Nadia Shireen. "But there are only 3 of you. How will you be able to do this?" Because we have the best customers in the world and some have volunteered to look after the authors on their trips to the schools. Good old World Book Day. Please get behind it if you can.